We often write about collections that have already been digitized, but today we want to give you a sneak peek of a forthcoming collection that we’re working on right now. The BC Historical Documents are a variety of papers, correspondence and text that have been identified as being representative of the documentary history of early British Columbia. These documents highlight the growth and development of BC over time, and feature some key figures in our social and political history. This collection is made up primarily of personal papers, letters, photos and ledger books, as well as a number of educational records such as curriculums and class lists. 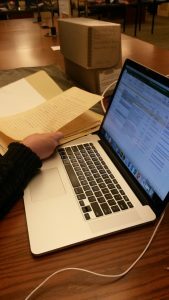 Two graduate students from UBC’s School of Library & Archival Studies are working on digitizing these records and adding metadata to them. Through this work, both have had the opportunity to interact with rare and interesting materials, including police reports, yearbooks and personal letters. In one instance, a set of yearbooks from the Provincial Normal School shows the direct impact of World War I, with the 1914/1915 graduating class being half the size of the previous year, and the 1915/1916 yearbook documenting former students who had gone to war, as well as those that had passed away. A number of correspondence from noted politician and 12th premier of BC, Charles Semlin, demonstrate the complex balance between private and public life that political figures often must negotiate. In Semlin’s case, he was known as a conservative politician interested in curbing immigration from Asia and implementing wide-ranging reforms. Despite his divisive political leanings, however, Semlin was a source of financial support for numerous friends and acquaintances throughout his life, a fact well documented in his correspondences. Across these historical documents, it is possible to gain greater perspective and appreciation for the many components which have contributed to the building of our province, and the variety of stories that make this place unique. Stay tuned for more information about the Early BC Historical Documents collection!